Color Chiyogami Thousand Cranes Origami Paper 3"
Yuzen Origami Paper → Color Chiyogami Thousand Cranes Origami Paper-3"
Color Chiyogami Thousand Cranes Origami Paper-3"
The Color Chiyogami Origami 3" Thousand Cranes paper pack comes with 1005 geometric print paper in 15 beautiful colors. The 3" paper pack is perfect for creating your own 1000 cranes with a few sheets for practice. This Origami paper pack is perfect for creating 1,000 small cranes. 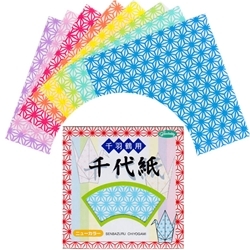 The Senbazuru Color Chiyogami Origami Pack - Thousand Cranes 3" contains all the sheets you need for your project. The extraordinary pack includes a rainbow of 15 beautiful colors, which contains 1005 sheets of geometric patterned origami paper. Each sheet is a 3”x3” square in size. Take the hassle out of buying individual sheets or paper packs with odd numbered sheets. This pack makes it easy with exactly the right number of sheets of paper you’ll need, all pre-packaged and ready to go. The tradition and the symbolism of 1,000 Cranes can make your next wedding, event or gift very unique! For the engaged couple, folding 1000 cranes together will take much patience and time. Those who invest in this time together can strengthen their upcoming marriage as the hours they spend will symbolize their long lasing love. Make preparing for your 1000 Crane project simple with the Color Chiyogami Origami Paper - Thousand Crane Origami paper pack!